I recently developed some new recipes for the Good Food Channel website, including a couple especially for Easter. I am not a big fan of fruit cake and as such the traditional simnel cake doesn’t often get made in my house. However I do like the idea of a big cake to share with the family over the Easter weekend, something that is especially for Easter. 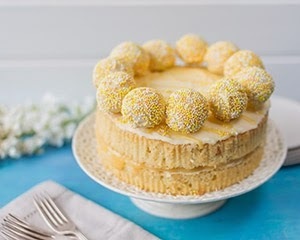 I came up with this zesty lemon simnel cake as a modern alternative, using cake pops coated in white chocolate to represent the apostles, instead of the traditional marzipan balls. It does require a little effort but looks impressive and will appeal to kids and grown ups alike. I used a version of this as a birthday cake too. This worked well as the children ate the cake pops at the party and took their cake slices home with them. This cake was baked by my lovely friend Katie at Feeding Boys and a Firefighter, and photograped by Sharron Gibson of The Image Garden, for the Good Food Channel website, where you can find the recipe. 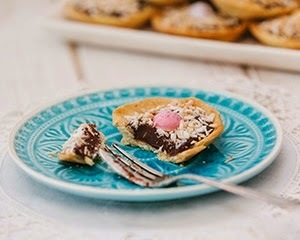 I also came up with some chocolate ganache and coconut tartlets, topped with a Mini Egg to look like a little nest. These are very moreish, and I find it hard to stop at eating one, but I do love that dark chocolate and coconut pairing. These are quite simple to make, and again the recipe is over at the Good Food Channel website. 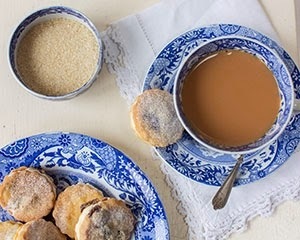 Katie also wrote a lovely Easter recipe for Good Food – these delicious and dainty simnel biscuits. Incorporating all the flavours of a simnel cake, these a lighter treat to have with a cup of tea, and as Katie says, they would make a great Easter gift alternative to chocolate.